India's Meteorological Department has been pulled up for being pricey. The Central Information Commission has asked the department's director-general to make a written submission about making rainfall data public. It has, earlier, not allowed free access to such data on grounds that it earns money by selling such information. The order came in response to an appeal by the South Asia Network of Dams Rivers and People. 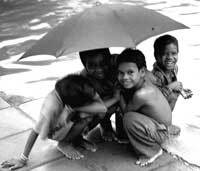 In March 2008, the non-profit sought monthly rainfall data of six Madhya Pradesh districts for the last five years. It was refused on the ground that "supply of meteorological data does not fall within the ambit of the RTI act, 2005". Himanshu Thakkar of the non-profit said, "The reply shocked us. Petitioning the department's appellate authority proved futile. So we filed an appeal with the commission." Information commissioner A N Tiwari has directed the department to "make the annual and monthly rainfall data for all the districts of India public on its own regularly".